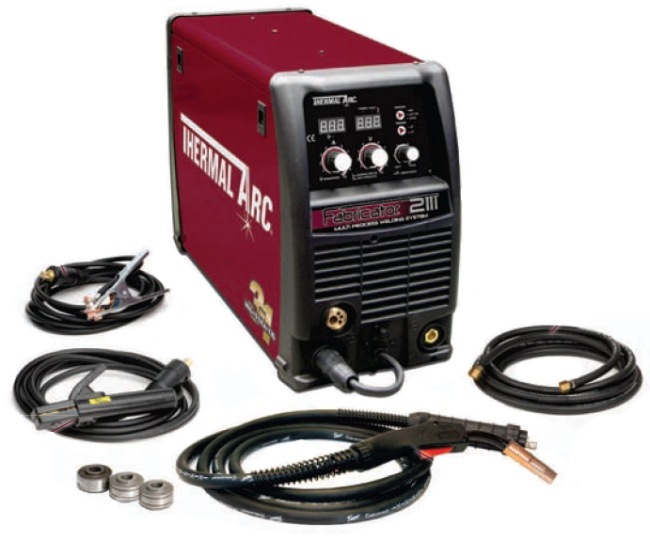 The Thermal Arc Fabricator 211i is a dual-voltage, full multi process, digital control, DC, CC/CV, MIG/ Stick/Lift TIG inverter power supply designed for precision MIG, DC TIG and Stick welding. This unit is equipped with an integrated wire feed unit (100mm, 200mm, 300mm spools), voltage reduction device (applicable in stick mode only), power factor correction, digital voltage and amperage meters and a host of other features in order to fully satisfy the broad operating needs of the modern welding professional. Dual Voltage: 230V Input allows up to 210A welding output for use in workshops. 110V Input allows up to 140A welding output for on-site work. PFC Power Factor Correction: Up to 40% more electrically efficient than conventional MIG Welders. 15kg Wire Spools: Use full size wire spools in a compact and portable welding inverter. Tweco MIG Gun with 3m cable and industry standard Euro connection. Durable Metal Feed Plate features 2 roll drive system, quick change reversible drive rolls and easy-to-set single scaled wire tension knob. 100, 200, or 300mm Spool Capacity allows easy installation of wire spool sizes. Adjustable Arc Force Control for optimum STICK electrode performance. Lift TIG Start: Provides TIG arc starting without use of high frequency. Gasless Steel Mig Wire 0.9mm Diameter. 5kg Reel. 308L Stainless Steel Mig Wire 3.75kg Spool. 0.8mm Diameter. Thermal Arc Gas Hose 5m With Quick Connector. 3/8" BSP to Regulator.